This former restaurant has been transformed into a luxurious home and needed a custom-made contemporary chandelier to create a dramatic feature, while adding warmth to the reception area. 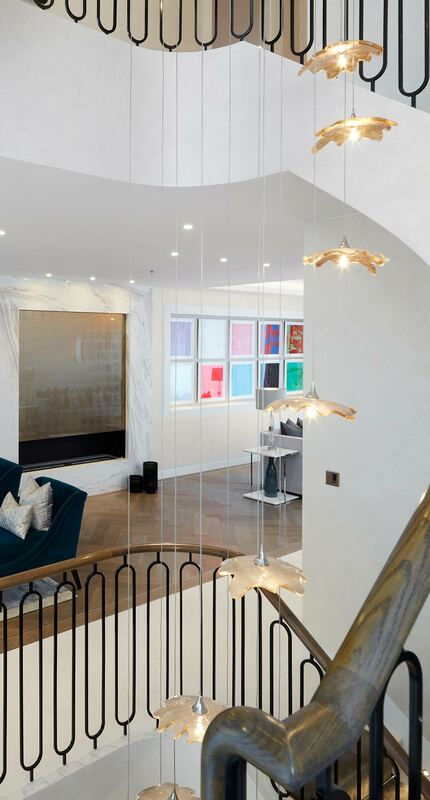 Our role was to take the interior designer’s concept for the stairwell’s statement installation and turn it into a reality. 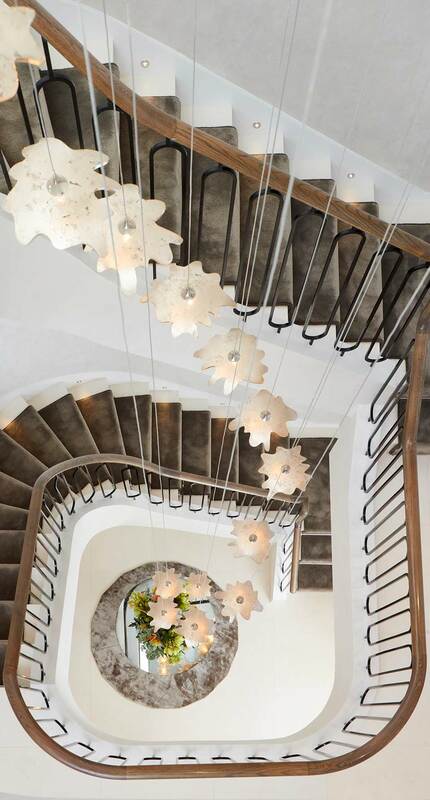 Inspired by natural forms, a spiral of light from 24 petal-shaped shades gently cascades through the stairwell. The hand-applied gold leaf shades are attached to fine cables, which are fixed to a polished nickel double-frame circular structure at the top of the house. 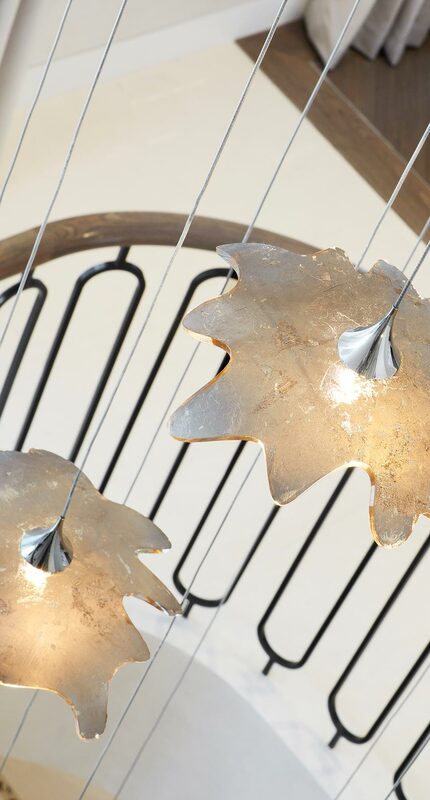 Each shade has been laser-cut from acrylic and then drape-formed over a mould – the edges were hand polished to achieve a crisp top edge and a curved bottom edge. Precision-machined components, with a polished nickel-plated finish, house the lampholder, clamp the cable and beautifully transition from the cable to the shade. Attention to detail, through a process of drawing, CGI and prototypes, has ensured that the light both reflects off and passes through the shades, creating a soft, radiant effect within the space. 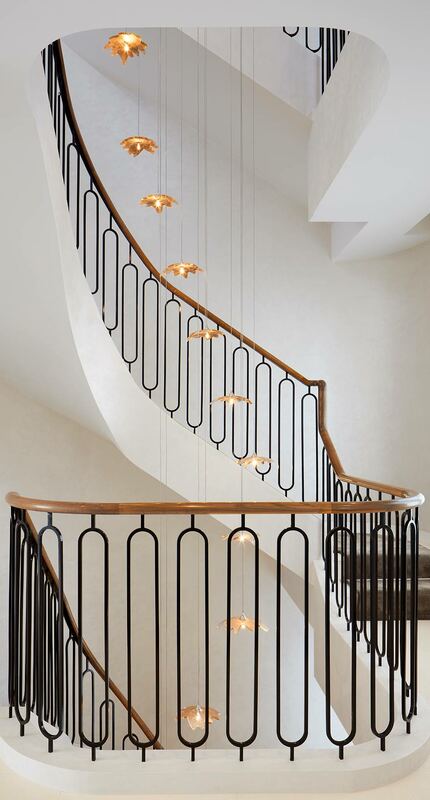 The floating, sculptural quality of the bespoke chandelier – called the “Flora Pendant” – makes an eye-catching statement, and complements the muted backdrop of polished plaster walls, wrought iron balustrade and oak handrail.